Do you miss the feeling you had as a kid in the candy store? All the choices, the colors… Maybe the test I’ve started today can bring back the feeling! These knee-high socks knit from the cuff down offer almost as much selection as a candy store to a kid! Treat yourself to knitting cables, stripes and cute stranded hearts – the resulting socks don’t even have calories! 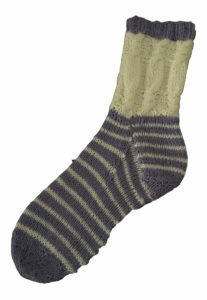 These mid-calf socks, knit from the cuff down, will have you feeling like a kid in a candy store! Little sister isn’t quite ready for stranded colour work and the shaping involved in knee-high socks, but she can’t wait to try cute cables and stripes, lots of fun and a chance to play with colour. This tasty treat doesn’t even have calories! Try using a self-striping yarn, either as the only color or for the contrast color. I hope to see you in my Ravelry group if you’re interested in testing one of these socks for me – only one sock needs to be done for the test!